The agri-food sector has coped better than other industries, such as manufacturing, with France’s economic problems of the last few years. However, businesses in the sector are struggling with rising production costs, while gross margins have decreased for several years. This hinders businesses´ investments and thus their international competitiveness. In 2013 the number of insolvencies rose slightly to 316 (excluding artisan food producers) compared to 297 in 2012. However, the sector’s insolvency level is still lower than in other industries. According to the French Ministry of Food and Agriculture (AGRESTE), food production (including beverages) rebounded 1.3% in Q2 of 2014. This year the industry has benefited from falling raw material prices and a weaker euro, which helps to boost competitiveness abroad. In the first half of 2014 the food trade balance remained positive, although it had decreased: mainly because of a lower beverage trade surplus. ANIA expects investments in the food industry to increase 7% in 2014. The Russian embargo: while direct consequences seem quite limited, the French food industry may be affected by increased competition in Europe and a drop in sales prices. This will hit the fruit and vegetable, dairy products and pork subsectors. Bargaining with retail chains is expected to become more difficult as some retailers (Intermarche and Casino; Système U and Auchan) have announced new alliances to strengthen their leverage. This will have a particular impact on branded food products. We expect the notifications of non-payment that we receive to remain stable in the coming months. 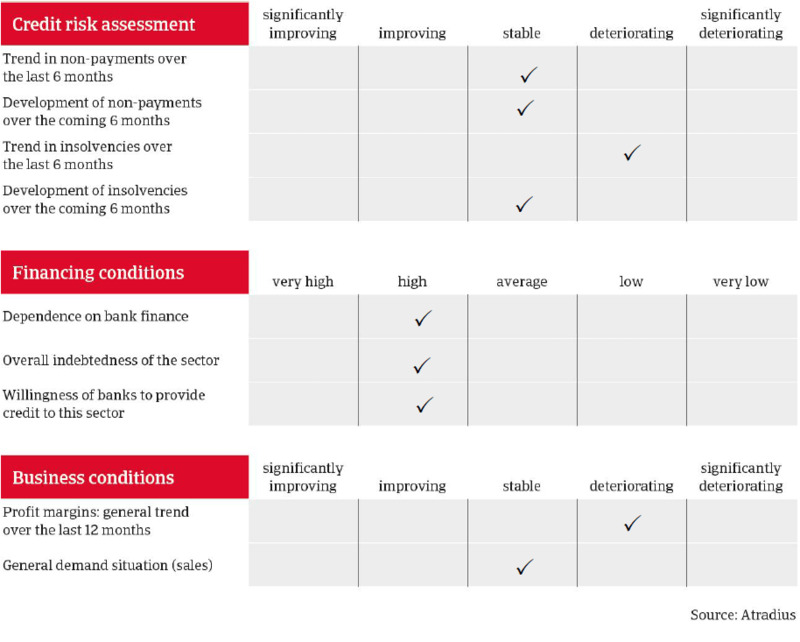 However, a slight deterioration cannot be ruled out in certain subsectors, and some companies may find little support from their banks. French food businesses are generally highly dependent on bank finance and many companies have high short-term debt to finance their working capital requirements. Food insolvencies have increased slightly in recent months (by 1% in Q2 of 2014 and 1.5% in Q3). We expect insolvencies to remain more or less stable in the coming months. The negative aspects of the Russian ban, low demand in Europe and more difficult price negotiations with retailers should be offset by further decreasing commodity prices and a weaker euro exchange rate. With a 20.5% share of sales and with 26% of food sector employees, meat is the largest food subsector. In 2013 and 2014 it was faced with weak demand, the Russian embargo, high input costs, overcapacity and international competition. The French meat industry is composed mainly of small companies and even French groups are quite small compared to their foreign competitors. According to AGRESTE, meat production fell 2.4% in 2013 and continued to decline in 2014, by 3.7% in Q1. Production recovered slightly in Q2 of 2014 (up 0.3%), due mainly to lower raw material prices, and this was the first sign of growth since 2011. However, while the cattle and pork segments have rebounded slightly, poultry remains troubled by low demand in both foreign and domestic consumption and the outlook for the coming months is downbeat. There have been some prominent recent bankruptcies, including slaughterhouse GAD and poultry manufacturer Tilly Sabco. Dairy products form the second largest food industry, accounting for 17% of total food sales. Production fell in 2013 and in the first half of 2014 (down 3.4% in Q2 of 2014) due to lower demand. However, sales increased thanks to higher sales prices for milk. The price paid to French farmers remains high: up 5% year-on-year at the end of August 2014. However, the price could begin to drop again by the end of this year. International milk powder and butter prices have already fallen for several months, and this downward trend has accelerated since the summer due to fewer Chinese imports and the Russian embargo. This is likely to have an impact on the French milk industry, as around 20% of its sales are made abroad. Another challenge will be the abolition of EU milk quotas at the end of March 2015: the industry is gearing up for this with revised partnerships and investment to meet higher capacity. Fruit and vegetable prices fell this year as a result of pressure on sale prices, a drop in consumption in the summer, because of unfavourable weather, and the impact of the Russian embargo. According to INSEE, fresh fruit production prices decreased 23.5% year-on-year in September 2014. Indeed, the production price of apples, France’s main fruit product, dropped 33% on a yearly basis in September. The beverage industry represents 16% of total food sales and exports about 30% of its sales. After a 4% decrease in 2013, production rose by 9.3% and 3.9% respectively in Q1 and Q2 of 2014. The trade balance remained positive but lower due to fewer wine exports (related to lower production), partly offset by higher champagne exports. While our underwriting stance towards this sector remains generally relaxed, we are keeping a closer eye on certain subsectors, especially meat and dairy, because of their challenging market conditions. We contact buyers for their latest financial accounts and forecasts, and monitor their working capital requirements, cash situation, debt repayment, investment and financing plans, and assess the support they receive from financial partners. It helps greatly if our customers let us know if their need is temporary, as is often the case in the fruit and vegetable subsector or in other seasonally affected sectors. We try to meet our customers’ requests whenever possible and, indeed, where our assessment of the buyer or subsector is particularly positive, we encourage the customer to extend further credit.